World Superbikes rider Jonathan Rea has been testing his new MotoGP bike ahead of standing in for world champion Casey Stoner. Stoner is after breaking his ankle in a crash in Indianapolis in August and Northern Irishman Rea, 25, will deputise for the Repsol Honda team in Misano and Aragon. The Northern Irishman rode 62 laps at Motorland Aragon. He recorded a fastest lap of one minute 50.057 seconds. That was some way behind his team-mate Dani Pedrosa's quickest lap of one minute 47.983 seconds. Rea said: "It's been a good opportunity to test before the race. "The Repsol Honda Team gave me the best opportunity, knowing the bike and the circuit and I am constantly learning." The practice also saw Pedrosa try a new exhaust to improve the power delivery of the engine, while he also tested a modified rear shock to increase grip. 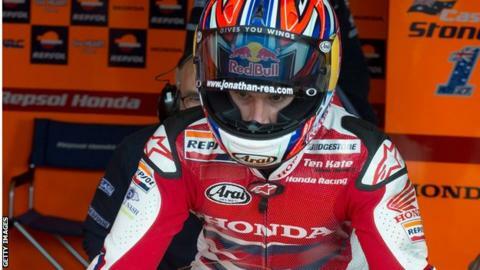 Ten Kate Honda rider Rea is fifth in the World Superbike standings and returns to action this weekend when he takes part at the Nurburgring in Germany. He will then take part in MotoGP rounds in Misano and Aragon, starting in Italy on 14 September.